In 2017, Finland will celebrate its 100th Independence Day. It has been a long and turbulent path to prosperity for this Northern European nation, but today, Finland is a stable democracy. This book outlines the key historical events that created the nation. 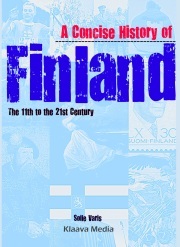 The story of Finland starts from the early Middle Ages, and takes readers to the new challenges set by globalization. Geographically located between East and West, Finland has been influenced and ruled by both cultures. The King of Sweden ruled Finland until the early 19th century, when he lost the scarcely inhabited territory to the Czar of Russia. 100 years ago, when the last Czar was dethroned, Finland seized the moment, and became a sovereign state. It, however, meant the beginning of a civil war. Later, Finns fought for their independence in the Second World War. History isn’t about wars alone. The book describes how international relationships and a strong president can define a nation for decades. The concept of Finlandization can still be a touchy subject for Finns, but it is an elemental part of the nation’s history. Today, Finland is the home of some 5.4 million people, millions of Angry Birds, rock group Nightwish and Nokia. Finland is also renowned for its high rankings in global school system comparisons and for its economical competitiveness. A Concise History of Finland starts from 1000-year old events, but the focus of the book is on the 19th and 20th centuries. The book is a perfect guide to Finland’s past for travelers, students, business people, media, and everyone interested in history. as well as on other Amazon Kindle stores across the world. The Apple iBookstore, where you can access the book from your iPad, iPhone or iPod touch.